It started in early winter. A pile of bird droppings on the ground outside our front door suggested that if we looked up we would see a nest, maybe of a Welcome Swallow, tucked under the eaves. But a search revealed no swallow’s nest, or nest of any kind, or even a hole in the fascia boards through which a bird might enter to create a nest. Day by day the pile of poo continued to grow. 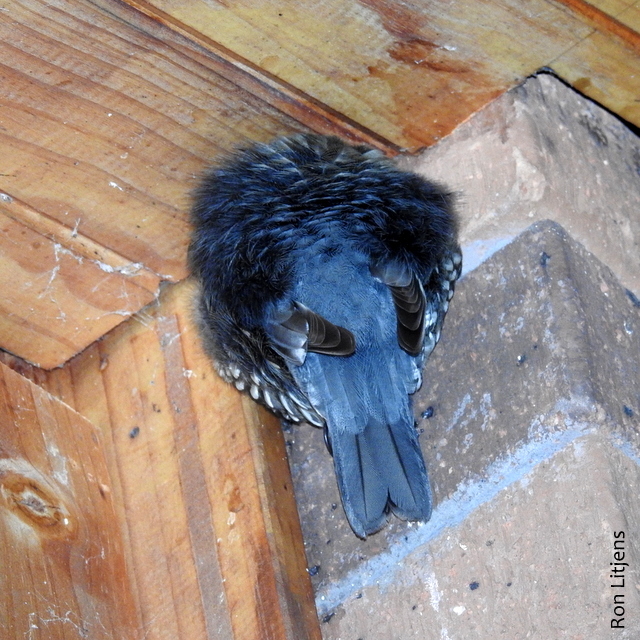 During the day nothing inhabited the eaves above the door but after dusk we noticed a grey/brown bird (pictured left) clinging to the brickwork, asleep. Passing this photograph around the local birdos resulted in a range of guesses about what the bird was but I wasn’t about to disturb the roosting bird to find out. Time for the motion-sensing camera! 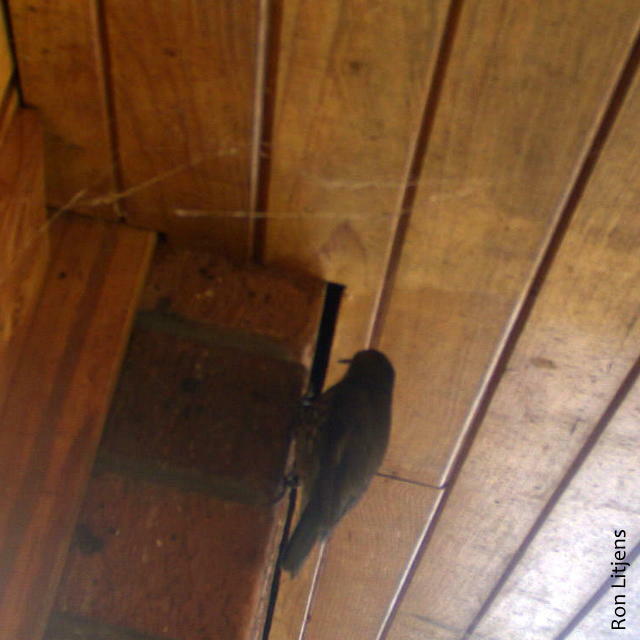 Using a jury-rigged system of stepladder, occy straps and pipe insulation, the camera was set up to reveal our visitor to be a White-throated Treecreeper (Cormobates leucophaea), pictured right. 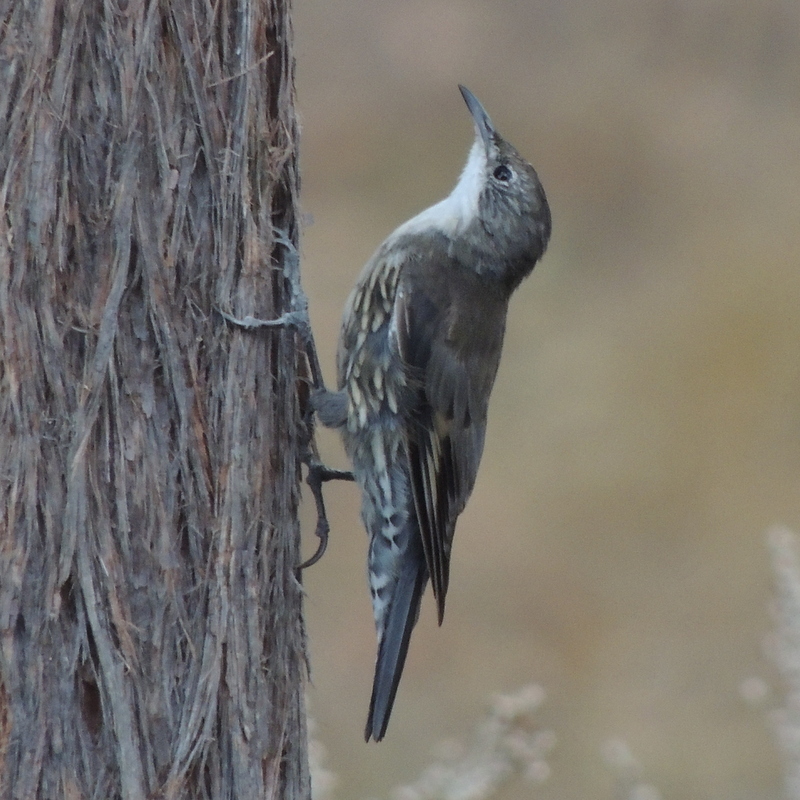 Perching birds such as treecreepers can sleep clinging to branches and vertical surfaces. Their legs and feet are controlled by special tendons so that when a bird bends its legs the feet automatically close. It’s analogous to having your toes curl every time you sit down. In this way birds can sit and be securely locked on to a branch or surface to sleep. A look at the size of a treecreeper’s feet (pictured left) shows that it can easily support itself to cling to our vertical wall. On our property individual animals that we regularly come into contact with are given ‘human’ names. Focus on Fauna is scattered with accounts of the exploits of Wally the Southern Brown Tree Frog and Cato the Swamp Wallaby. In keeping with this tradition we are naming this bird as well. Given where it sleeps at night, and assuming it’s a female, we have dubbed it Evie. We also saw a few roosting inside the Cheviot Tunnel at Limestone on a recent UGLN spotlighting night.